How you respond to Stratford’s latest production of As You Like It will depend on why you go to see a play by Shakespeare. If you go to see a Shakespeare production because you enjoy the Bard’s poetry and insight into human nature, then you should give this As You Like It a wide berth. However, if you go because you enjoy a fun party atmosphere with lots of audience participation and no need of understanding the story, then As You Like It will be right up your street. Director Jillian Keiley has come up with a concept for Shakespeare’s comedy that was likely intended to enhance the audience’s enjoyment of the play. Unfortunately, she goes so far overboard on her concept that the result is now all about her and not at all about Shakespeare. Before entering the auditorium every audience member is told to pick up a little bag containing various items they will need during the performance. For most theatre all you need is eyes, ears and a brain, but Keiley obviously thinks those are not enough. In my bag was a fake pine branch, a poem written in a child’s handwriting, a clothespin, a fan and a green crepe crown like the kind you get in Christmas crackers. Other people got stars that lit up, boxes that baaed like sheep and cowbells. As you enter the auditorium a Newfoundland fiddle band is playing, people are dancing and actors are mingling with the audience. When the lights dim we discover that the show has an emcee who happens to be the goddess of marriage Hymen (Robin Hutton). She tells us that in Newfoundland everyone takes part in telling a story and we happen to be in Newfoundland in 1985. Usually when a theatre company relocates a play by Shakespeare it is because a new time and place will help bring out aspects of the the play by making them more obvious or relevant. Keiley’s relocation of the play does neither. This is a play with dukes and princesses who flee an aristocratic court for a pastoral life in a forest inhabited by shepherds and shepherdesses. How do these aspects possibly fit in with Newfoundland or with the date of 1985? If the date were before 1949 when Newfoundland was still a crown colony ruled directly by Great Britain, some sense might be made of the new setting. As it is the entire play goes by without the new time or place making any sense or providing any insight into the action. In fact, because there is no royalty in the province and because Keiley has a “shepherd” dressed in full punk regalia arrive on stage in a dinghy, it is clear that she really cares nothing about any of the vocations the characters are said to have. One characteristic of As You Like It is how a hierarchical order is overturned when it is exiled into natural surroundings. If, as here, the power relationships among the characters are unclear along with the reasons for exile, the entire process of a new society re-forming in nature is also unclear. Keiley’s new setting simply muddies the waters. Keiley is more interesting in forcing the audience to have “fun” than in following Shakespeare’s narrative. She says in her Director’s Notes, “You’re being part of a kitchen-party, a dance-together culture – wherein the art is not to be examined or observed but to be experienced by all of us, together in a circle”. It’s understandable that Keiley would want to draw on her Newfoundland background but as her statement and the resulting show make obvious, the production is all about what a Newfie kitchen-party is like and not what Shakespeare’s play is about since she does, in fact, leave it unexamined – rather the opposite of what you would expect a director to do with a play. bleating boxes are supposed to make them bleat. When he later refers to his cows, those with cowbells are told to tinkle them. When the scene changes for unknown reasons from the forest of Arden to the sea, we’re told to get out our blue fans and do the wave while holding them. When Celia is hunting, a lit white object in the shape of a rabbit is passed though the audience. When we’re by the sea a lit blue object in the shape of a whale is passed through. The result of all this interaction and participation is that the noise and the actions themselves constantly distract us from the play. Indeed, you feel that the play is really incidental to the party. As if that were not enough, Hymen periodically interrupts the action to say “Now let’s have a song” and her band plays for a bit. Or once she says it’s time for a song “And you will sing, too!” whereby she teaches us a call-and-response song having nothing to do with the action and stops the show cold. All of these interruptions are the reason the play runs for nearly three hours. Keiley may have intended to recreate the feel of a kitchen-party but the actual result with Hymen constantly ordering us to do things and exhorting us to have “fun” is like being in an old folks’ home where the entertainment director treats 80-year-olds like preschoolers. Some people may think that blindly following arbitrary orders to do silly things is “fun”, but others will remember that they have had perfectly enjoyable evenings at a Shakespearean comedy simply if the play is well done. Keiley’s kitchen-party notion of presenting the play does explain why she overloaded the play with anything-for-joke gimmicks. Rosalind frequently grabs the sock she’s stuck in her pants in her disguise as a man – big laugh. 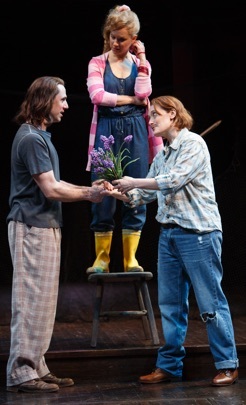 Silvius (Jamie Mac) pulls in his boat and asks an audience member to hold his “dinghy” – big laugh. Celia with headphones on imitates Michael Jackson’s dancing in “Thriller” – big laugh. Orlando (Cyrus Lane) kisses the gay LeBeau (Antoine Yared) on the mouth who mimes ecstasy – big laugh. 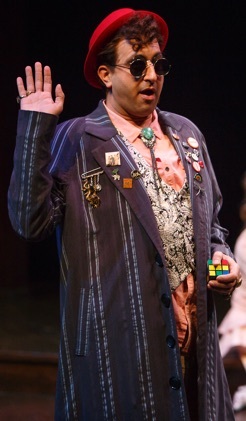 Duke Frederick (Scott Wentworth) enters talking on a clunky 1980s cellphone with a big antenna – big laugh. The problem with all these gags is that they have nothing to do with the text. As You Like It is a play filled with humour, but Keiley is not interested in bringing any of it to light. In fact, the only joke written by Shakespeare that gets a laugh in the entire play is Rosalind’s advice to Phoebe (here spoken by Jacques), “Sell when you can: you are not for all markets”. Other remarks in the text that have always got laughs in other productions, she misses completely, like Touchstone’s complaint to his future bride, “Bear your body more seeming, Audrey”. Given a director who admits to not examining the text, it is not surprising that the majority of the performances are mediocre or worse. What does surprise given the Newfoundland setting is the inability or ineptness of most of the cast in essaying a Newfoundland or at least a Maritime accent. There is no dialect coach listed in the programme so one assumes the actors had to fend for themselves. While one actor, John Kirkpatrick as Oliver Martext, speaks in a Newfie dialect so thick that Keiley makes it a joke by having Audrey translate it, the only other actor to speak in a consistent Maritime accent is Halifax-born Sanjay Talwar as Touchstone. Some decide to emphasize the hard Rs. Some focus on the flattened short Os. 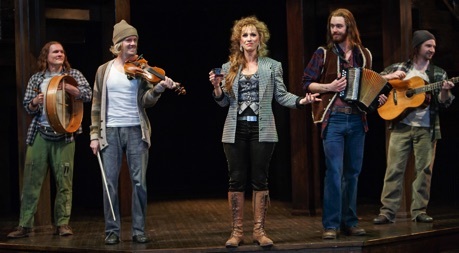 Others like Scott Wentworth as Duke Frederick and Seana McKenna as Jacques speak standard Canadian English while Brian Tree as Old Adam speaks his standard Cockney. Use of an accent could have been a way of telling the country folk from the exiled city folk, but with everyone but Talwar putting on some unsuccessful form of accent the distinctions are completely muddled, and worse, many of the lines incomprehensible. were head-over-heels in love with Orlando near the end. The comedy of Rosalind disguised as a man teaching Orlando how to woo a woman, amazingly, is completely lost. As she works her way through traditionally male roles in Shakespeare, Seana McKenna as Jacques gives the best-spoken performance of the evening. Free of a regional accent and unburdened with shtick, she is the actor who digs the deepest into the text. Only for Jacques’ “All the world’s a stage” speech does Keiley keep everything silent and unbusy. That attitude tends to make one think that Keiley sees that speech as the only important one in the play. Would that she had thought the whole play important. Among the others, Matthew Armet stands out as a sweet-voiced Amiens, David Collins as a genial Collins, Ijeoma Emesowum a fiery Phoebe and Brian Tree a kindly Adam. Since this is Keiley’s third year in directing at Stratford, she should have known that the idea of presenting a Shakespearean comedy as part of a party had been done just two years ago and with infinitely more insight in A Midsummer Night’s Dream directed by Chris Abraham. There Abraham conjured up a celebratory atmosphere without audience distractions or shticking up the text. 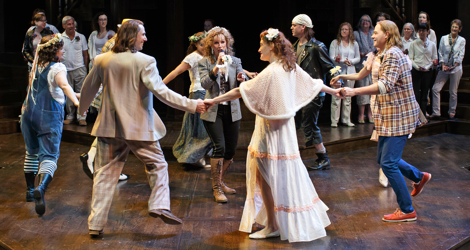 Keiley ought also to have known that Stratford had already presented an As You Like It set in Canada in Richard Monette's beautiful autumnal version in 1990 set in New France. There the idea of French-named characters fleeing a court and finding refuge in a natural environment made perfect sense. Like Macbeth, As You Like It is staged at Stratford about every five years. There is, therefore, no need to see this production which well intentioned as it might have been, shows so little respect for the text. Photo: (from top) Cyrus Lane, Robin Hutton, Patricia Bromley, John Kirkpatrick and ensemble; Graham Hargrove, Dan Stacey, Robin Hutton as Hymen, Keelan Purchase and Kyle Waymouth; Cyrus Lane, Trish Lindström and Patricia Bromley; Sanjay Talwar as Touchstone. ©2016 David Hou.